In a note to investors, an analyst at Raymond James made the decision to upgrade BlackBerry stock today. The analyst, Steven Li upgraded BBRY from a rating of Market Perform to an Outperform rating. At the same time, the analyst decided to increase the price target on the stock from $8.00 per share to $10.50 per share. He went on to explain that in the worst case scenario, the DTEK 50 flops. From there, the company moves to focus wholeheartedly on software. Steven Li believes that this would be positive because the company is already moving in the right direction with regard to software. One of the first things that we learn as investors is that the news tends to move the market. The news that was released surrounding BBRY today was overwhelmingly positive. So, it only makes sense that we saw a positive reaction in the market today. By the end of the trading session, the stock closed the day at $8.08 per share after a gain of $0.20 per share or 2.54%. Moving forward, I have an overwhelmingly bullish opinion of what we can expect to see from BlackBerry. At the end of the day, I’ve maintained opinion for some time now. When BBRY released the Priv, I was overwhelmingly impressed by the move. After all, we’re talking about the company that was the driving source of innovation in the smartphone arena. The new DTEK 50 is a great opportunity. The low price on the phone makes it a great enterprise offer. However, we know that anything can happen here. While I don’t think that the phone will flop, there’s no guarantee that it won’t. Nonetheless, even if it does, the company is making big waves in the software arena, and a stronger focus there can only improve the outlook. All in all, I think Steven Li hit the nail on the head and that we can expect to see gains in BBRY moving forward. Where do you think BBRY is headed moving forward? Join the discussion in the comments below! 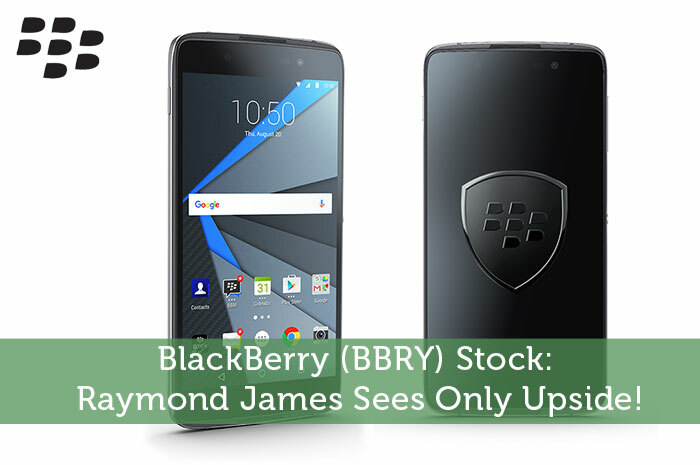 BlackBerry (BBRY) Stock: Raymond James Sees Only Upside! I agree that things definitely look up. I would like to see them make a phone that appeals to the consumer market on a broad scale. The DTEK50 looks more like they’re trying to sell it as bundled with enterprise solutions. Even the name doesn’t really resonate as a consumer targeted product.